Alpha radiation therapy is essential in radiotherapy for the cancer patients. The radio-isotopes of actinium and bismuth which are 225Ac and 213Bi, respectively, are considered to be the most effective alpha radiation emitters. These isotopes can be used for radiolabeled isotopes in clinical trials or as alpha radiation sources in linear accelerators. Global supplies of these isotopes are insufficient to fulfill the clinical demands for therapy which is projected to increase with a growing demand for radiopharmaceuticals in research and medicine. Procurement of these isotopes is done through a combination of public and private funding, involving government agencies which handle decaying nuclear fuel and private chemical processing plants which isolate the elements. The health hazards associated with high radiation levels also pose a significant logistical challenge, which adds to the costs of such efforts. Current production technologies have yet to prove themselves sustainable enough to provide a complete solution. This review published in Current Radiopharmaceuticals gives information about current supplies of 225Ac. Readers will find details about the historical and current supply of actinium, the current production routes (as a function of radioactive decay of parent elements and the nature of particle bombardment to produce larger quantities of the isotopes) and a summary of the current situation in relation to isotope generating supply chains. 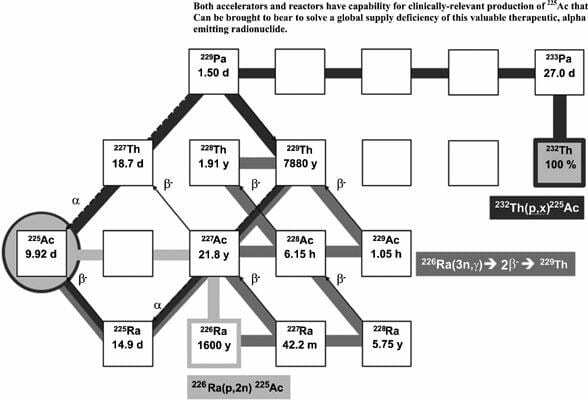 The reviewers conclude that while most 225Ac production options are uniformly costly, 2 production routes relying on the irradiation of 226Ra/227Ac and 232Th targets produce higher yields which may serve the needs of an increased demand in actinium due to expanding medical programs and related clinical trials.